So who is this Schwarzman guy anyway? To find the full answer, you have to read our book. Really. Meanwhile, Vanity Fair discovered Schwarzman after his birthday party and Blackstone’s IPO and began churning out stories in which he figured prominently, including: Michael Shnayerson, “Hamptons Overdrive,” August 2008. Sadly, Shnayerson’s October 2007 piece on the rivalry between Schwarzman and KKR’s Henry Kravis doesn’t seem to be available on the magazine’s site. recounts two parties of Schwarzman’s. 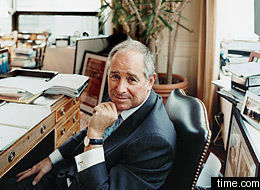 Finally, for fun, there’s “Blackstone Chief Seeks $7.2 Million for Hamptons Home,” New York Times blog, Aug. 28, 2009.